Bay Area thrash stalwarts Testament doggedly survived the collapse of the thrash scene in the early-90s, lead guitarist Alex Skolnick's 10 year jazz sabbatical and a roster of ex-drummers that could rival Spinal Tap, but unlike many of their peers, they've entered 2012 in some of the best shape of their career. 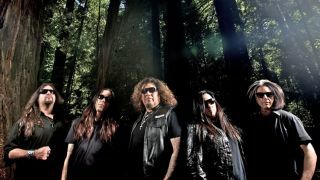 Testament kick off their UK tour tonight (27 November) at The Garage in Glasgow. See below for the full list of dates. "We realised how hard it was. The playing is the easy part, it's just everything in between - that's what breaks bands up." 2012 marks the 25th anniversary of Testament's debut album, The Legacy. What were your initial expectations of the band? "We were watching a lot bands around us fold on their second or third album. We realised how hard it was. The playing is the easy part, it's just everything in between - that's what breaks bands up. I don't think it's the music at all, it's the chemistry. It's dealing with all of the downtime in between the two hours you're onstage." "When you're a thrash band, it's not a good idea to add rap, or start wearing trippy clothes - the fans can see right through that crap." What's the most important lesson you've learned in your years as a musician? "Just being consistent and sticking to your blueprint. It's easy when other bands come into the scene that are like a whole new different style to go, 'I wanna be like that now!' But we have a following and we've got to be like, 'This is how we are!' It's very important that you stick to your guns. When you're a thrash band, it's not a good idea to add rap, or start wearing trippy clothes - the fans can see right through that crap." What's the best tip you can give on great thrash metal guitar tone? "We used to use a lot of different effects and pedals to try and get a certain sound, but a lot of it is in your playing. It's in your right hand and it's about controlling distortion with your palm, by muting strings. But there are a lot of great amplifiers out there now that will help do the job. I wouldn't say one's better than the other, but there will be some that work better for you as a player." "I really think Eddie got it right. The first Van Halen record, the guitar tone was so hard and it just kind of changed not only rock 'n' roll, but heavy metal"
What amplifier are you using now? "I choose to use EVH. I just think the 5150 is the perfect amp for heavy metal. I really think Eddie got it right, because the first Van Halen record, the guitar tone was so hard and it just kind of changed not only rock 'n' roll, but heavy metal. It's like a harmonic distortion - really saturated and cut clean. It's not the dirty Black Sabbath, gargle-y, grungy sound, which works too - but it sounds like a certain period. For modern thrash metal, it's important to have precise distortion that's really controlled." What's your go-to guitar on tour? "It's a really good-sounding guitar. It's not too heavy, not too light and the EMG [81 and 85] pickups are just really consistent. Listen to the new Testament record [Dark Roots Of Earth]. I recorded nearly all of the guitar tones with that guitar." "Alex is still the lead guitarist, but I'm starting to do a little more soloing now. As players, we've all grown a lot." Alex Skolnick has been back with the band since 2005. Has the way you divide guitar duties changed over the years? "The duties have changed a little bit. Alex is still the lead guitarist, but I'm starting to do a little more soloing now. As players, we've all grown a lot. Alex has got a lot of influences and it really, really shows in his playing. When you hear his leads, you know it's him. But when Alex left the band I started taking on more. The other guitar players that I jammed with, first Glenn Alvelais and then James Murphy, were all like, 'Dude! How come you don't play leads? You're killer!'" "It wasn't like that before. No one said to me, 'Play leads!' It was just 'Alex is the lead guitar player, you're the rhythm. This is how we're doing it.' When Alex came back I said, 'I'm not going to step on your toes - we're not going to fight for solos here - but it's just going to add more to it.' And he was like, 'Totally, dude! You should totally do that.' That was a real breathe of fresh air, because the old way would have been, 'Well, I'm the lead guitar player.' We've all grown up now and it's such a better band [for it]." Dark Roots Of The Earth sounds like a band reinvigorated. What got you fired up when you were writing this material? "It started with the music. It was me and Alex. I still write most of the music, but arrangement-wise, rather than me just arranging it all, I would say half of the writing sessions were me and Alex sitting down together and really cleaning up. Utilising our strengths. And why not? We're a really killer team. Of course, there were a couple of hiccups, a couple of little battles here and there, but then we're both guitar players! The end result was awesome. I think we both had the same vision. Not everybody saw the light at the end of the tunnel, but it was like, 'It's going to be there. Trust me.'" You're over in the UK for some shows next week. Is there anything else we should mention? "Yeah. Life's hard, Testament's harder - we're coming!"